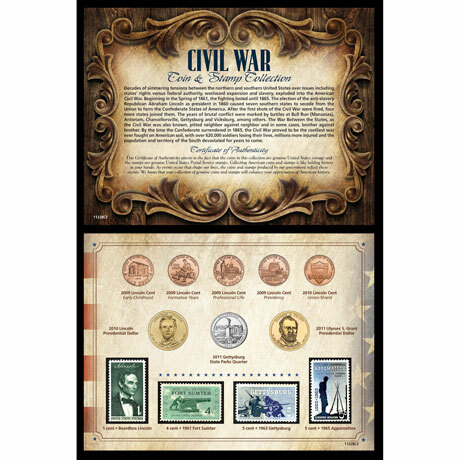 A wonderful collection of coins and stamps honoring the freedoms gained during the Civil War are featured in this Civil War Coin and Stamp Collection. The collection includes the four bicentennial Lincoln cents, the Lincoln Union Shield cent, 2011 Gettysburg National Park quarter, the Lincoln Presidential Dollar Coin and the Ulysses S. Grant Presidential Dollar Coin and four commemorative stamps neatly packaged in a vinyl wallet with a history sheet and Certificate of Authenticity. Allow 2-3 weeks for delivery. No rush delivery or gift box. Item can only be shipped within the Continental US.